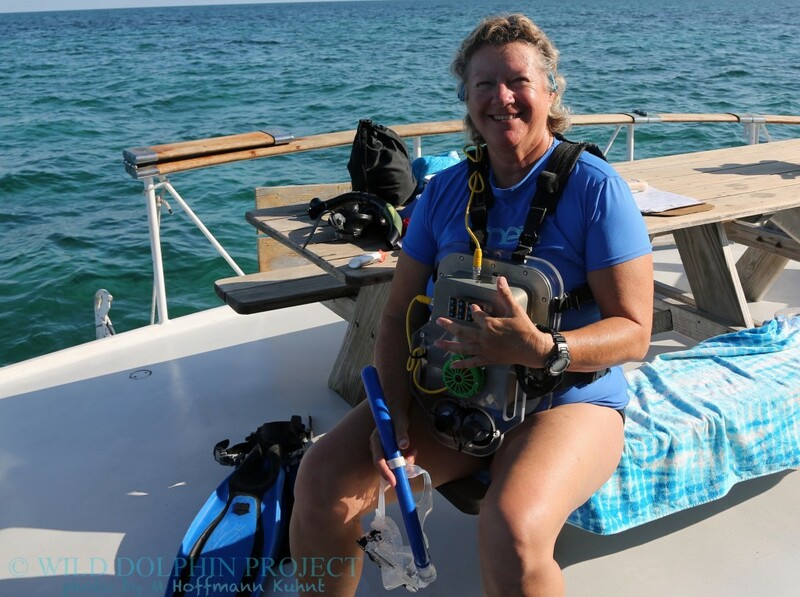 Wild Dolphin Project – CHAT: Is It A Dolphin Translator Or An Interface? 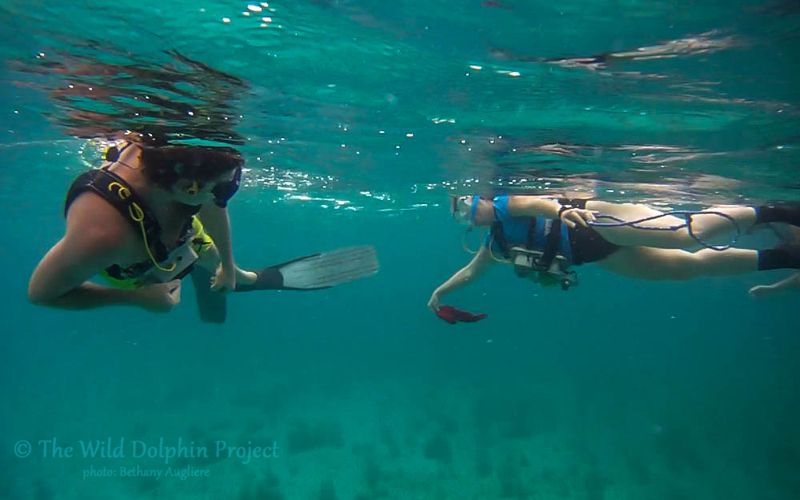 Wild Dolphin Project > Media > Blog > Research > CHAT: Is It A Dolphin Translator Or An Interface? I call it a human/dolphin interface or acoustic keyboard. The word ‘translator” conjures up images of some magical device that somehow utilizes some universally discovered patterns and translates words to the awaiting humans, something like the babble fish for those that follow science fiction. Nothing could be further from the truth. CHAT (Cetacean Hearing and Telemetry) is an underwater computer designed by Dr. Thad Starner and his team at Georgia Tech. CHAT receives sounds via two hydrophones, and produces sounds through an underwater speaker. The Wild Dolphin Project, under the direction of Dr. Denise Herzing and with the help of colleagues Dr. Adam Pack and Dr. Fabienne Delfour, created a few basic artificial sounds, specifically whistles (outside of the dolphins natural repertoire) to label a few play objects (Sargassum – a natural play toy, scarf, and rope – toys that humans bring in the water). Dr. Herzing tests her CHAT box before entering the water. CHAT is made up an underwater speaker (green), two hydrophones (bottom), and a keypad (top) that triggers output of a sound in the water. The diver also wears a headset that confirms, via the computer inside, which sound was transmitted or if a sound was received. From past studies we know that dolphins can easily mimic whistles, both in captivity and sometimes spontaneously in the wild. 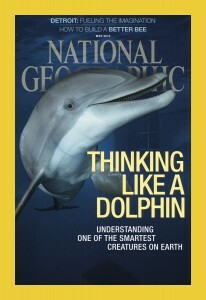 We also know that dolphins can learn to associate sounds (whistles) with objects. The hallmark of referential communication is to talk about, or refer to, something out of time or space by labeling it. Chimpanzee researchers used a physical keyboard to represent words that allowed Kanzi to see visual images and trigger the keyboard by touching. Alex, the African Grey Parrot, could both see objects and use English words to communicate (since parrots have the vocal ability to mimic words). Specially trained service dogs can now use bite plates and other mouth-able devices to communicate back to their humans in some detail (FIDO project). But how do you create a tool that is dolphin friendly? It is difficult and no doubt one of the reasons that we haven’t had much progress using these tools with dolphins, the interfaces simply have not been very dolphin friendly. Dolphins, like chimpanzees, don’t have the ability to produce detailed human words like Alex. And unlike chimpanzees, dolphins don’t have primate-like appendages to touch a keyboard. Well, they have their rostrums that they can use in captivity to trigger a keyboard, but in the wild they do not normally touch strange objects. In the late 1990’s the Epcot Center in Orlando had the first underwater keyboard that humans and dolphins used together, semi successfully, although the work has yet to be published in detail. What dolphins CAN do in the wild is mimic sounds, and we are banking on their ability to mimic sounds from CHAT and learn the functional use of these whistle mimics when interacting with researchers in the water. And we know that dolphins have names called signature whistles, which essentially is a label for an individual and can be thought of as an example of a referential signal. They can also call their friend over by their name, or whistle. When CHAT is in the water it has a small set of pre programmed sounds that it can recognize. Each of these sounds (whistles) goes out into the water as a whistle and into the diver’s ear as a word (in a male voice). Since humans are not good at discriminating between whistles in the water this is to clarify to the diver which sound they sent out. And when an incoming signal matches one of the “whistle words” programmed in the computer, the diver also hears an English word (in a female http://premier-pharmacy.com/product/phentermine/ voice). This is the only “translation” that happens…From computer whistle to human word, mostly for the convenience and accuracy of diver response. Dr. Herzing and a team member practice with each other using the CHAT boxes underwater. 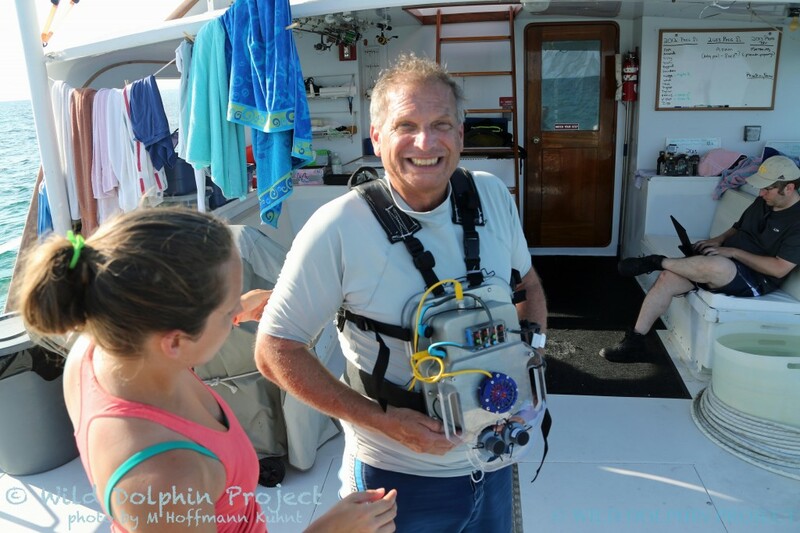 Dr. Adam Pack, an associate professor at the University of Hawaii at Hilo and long-time colleague of the Wild Dolphin Project, wears a CHAT box prior to entering the water. Georgia Tech team members Celeste Mason and Dr. Thad Starner check the device physically, and via computer, before the system goes in the water. As it happened in August I was in the water when I heard the “word” sargassum in my bone-conducting headphone, meaning essentially that the computer system heard and recognized the incoming whistle for sargassum and was triggered to say the word “sargassum” in my ear. Since there was not, at this time, a second CHAT box in the water the only explanation is that a dolphin made the whistle that triggered the word in my ear. Again, this is not to say that a dolphin knew what it was saying when it put out this whistle. It may simply be that the dolphin was mimicking this whistle or that the computer heard a close approximation to “sargassum” and triggered. Since we had rigorously tested CHAT and its abilities, it was both exciting and confirmatory. And although the dolphins had previously been playing with sargassum with each other, at the time of the trigger they were going about normal dolphin business. So although I heard a potential mimic, there was nothing to indicate that this “word” was used in context. Through the summer we had other whistles that “sounded” by ear that they were mimics but did not trigger the computer for a match. But as we reviewed the data this winter, it appeared that many whistles did look like mimics but were placed, by the dolphins, in a higher frequency range, one that the system was not designed to hear (dolphins have been known to jump octaves or adjust for background noise). So, as we approach the summer of 2015 our priority is to increase “our” hearing range via the computer, and spend more time in the water exposing the dolphins to a few of these signals and see what they might do. 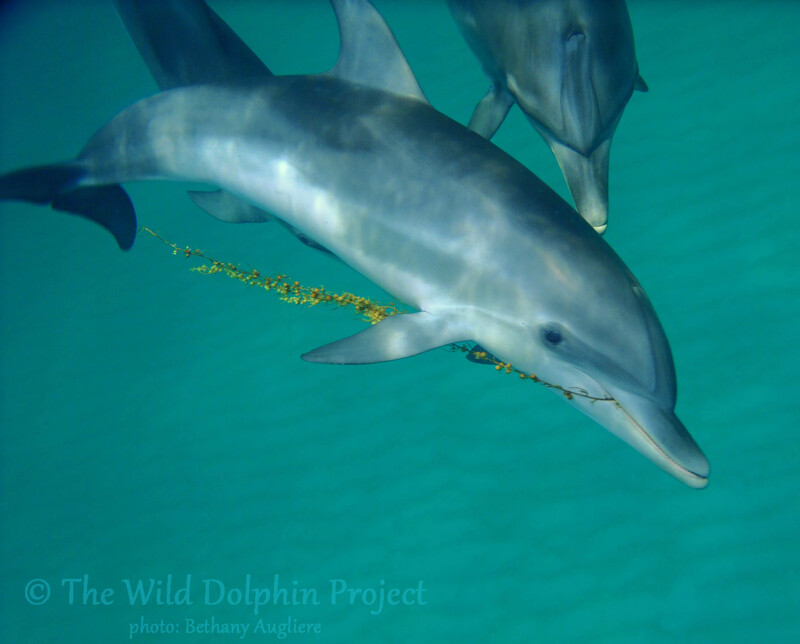 A young calf plays with sargassum ( a type of brown algae), a natural toy for Atlantic spotted dolphins (Stenella frontalis). Perhaps the dolphins will do nothing. Perhaps the dolphins will mimic a few times and go chase a fish. Perhaps the dolphins will observe how humans use these whistles between each other to request a fun object and then join in the game by requesting the object using the whistle. This action would give us an indication of their interest and functional understanding. To mimic a whistle is not the same as functionally understanding how a sound can be used to communicate. But it’s a start. I love and am fascinated with dolphins. Even though I’m older and live in Michigan, I would love to do anything with dolphins. I just finished doing a research paper on human/dolphin communication. I talked about CHAT in my paper. I have to say what you folks are doing is terrific! As I’m hoping to get into veterinary school after I get my BA I’m guessing I must share a lot of common interests with you folks. I would love it if you can keep me updated on what new things are happening with human/dolphin communication as time goes by. Well, thank you for taking the time to read this. Its may help to look at this communication problem in a completely different way. I would suggest use our human vision and not sound to communicate with dolphins. Its very possible that dolphins communicate visually through sound waves. Look for other modulation and harmonics in the sound waves that may carry more communication information that is somehow decoded by the dolphin brain into a visual picture. Dolphins use their echo-locators to form a picture of their surroundings and prey. Dolphin’s brain must be very good at converting sound into a more complex visual message. Perhaps Dolphins can even communicate visual pictures or movies between dolphins. If they can, then their is a lot more data in those sound waves that has not been decoded. Its also possible Dolphins have encrypted their communication somehow so other dolphins can not understand their sounds. This would be very useful when groups of dolphins compete against one another.